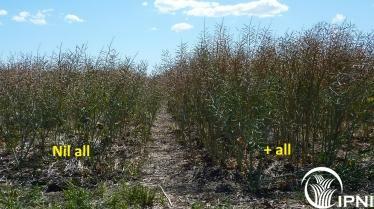 Summary of responses from nutrient omission experiments. The 2015 wheat trials at Bool Lagoon and Glenthompson showed an early biomass response to N and P by anthesis, but this did not translate into higher grain yield (see Table). There was evidence that additional P led to a reduced harvest index and lower grain size, which is consistent with the crop haying off under dry soil conditions during the grain-fill period. The 2015 canola trials showed a strong response in all measured parameters to additional N at Frances and both N and P at Inverleigh. There were positive grain yield and HI responses to S in wheat at Bool Lagoon in 2015, but negative responses to S at anthesis in wheat at Glenthompson (2015). Across all sites there wa only one significant response to micronutrients, which was for wheat (grain) at Glenthompson, and did not translate to a higher grain yield. Summary of significant effects of applied nutrients in the 2015 omission trials. Values separated by different letters are significantly different at the 5% level. For N effects, 2 lsd’s are shown. The first is for comparison between the lowest and middle rate, the second for comparisons between the middle and highest rate. This is because the lowest N rate was only applied to the Nil and +all treatments, whereas the middle and highest N rate were applied to all treatments. 14 Mar 2013What is 4R Nutrient Stewardship?